1828 Entire from Reading to Highworth showing manuscript "Not neare WANTAGE/73, BR 449. 1850 Cover from London to Englefield, Berkshire, showing a very fine 'MISSENT to/CHERTSEY' in red. 1855 1d Pink Envelope to London with, on the reverse, a WINKFIELD (under Chertsey) undated circle. 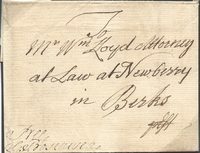 1785 Entire to Cavendish Square, London with, on the reverse, a First-type 74 FARRING/DON mileage together with a Bishop mark for "4/MA". 1852 1d Pink envelope to Middle Hill, Worcestershire, with, on the reverse, a HOLLYPORT (Holyport), Berkshire, undated circle in Blue. 1858 1d Pink envelope addressed to Oxford and cancelled by an Abingdon Sideways Duplex, Type VIII, Code C. Scarce. 1851 1d Pink envelope to Dublin showing on the reverse an ETON (under Windsor) undated circle. 1847 1d Pink envelope addressed to London showing a fine KINTBURY (under Hungerford) undated circle. 1824 Entire from Ireland to Reading with, on the front, a fine "Missent to" MAIDENHEAD/29, MS 1/4. 1886 4d Dull Green, SG 194, B-B, tied to envelope from Newbury "via Southampton" to Capt Brackenbury RN CMG/HMS "Hyacinth"/Pacific/via Panama. Ex Geoffrey Osborn. 1814 Entire from Maidenhead to Stratford, Essex showing a fine framed "crown/Too Late for/Morning Post", L 704. 1794 Entire to London with, on the front, a fine READING and a very fine READING HANDSTRUCK '4' in black. Scarce. 1836 Entire to Basingstoke showing a superb boxed NEWBURY/PENNY POST on the reverse, BR 275. 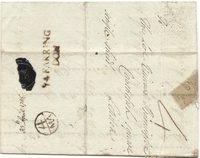 1843 Cover to Marlborough with a very fine BURNHAM/PENNY POST on the reverse, BR 75. 1750 Entire used locally in Newbury with a very fine two-line NEW/BURY, BR 228. 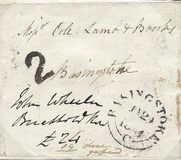 1844 Cover to Basingstoke showing a superb READING HANDSTRUCK '2' POSTAGE DUE in black, BR 344. 1789 Entire to London with a very fine two-line MAIDEN/HEAD. 1831 Entire to Bagshot showing a boxed SUNNINGHILL with "Penny Post" removed, BR 375. 1849 1d Pink envelope to Bracknell with a very fine BINFIELD undated circle in red on the front. 1849 Envelope to Lower Ward, Windsor Castle with, on the reverse, a very fine STAPLE CROSS undated circle in black and a fine WINDSOR/DE 29/1849/4 skeleton datestamp in blue. 1851 Envelope to Windsor showing on the reverse a WANTAGE/2 Skeleton datestamp in BLUE. 1913 East Hendred, Steventon (EBB) (under Abington) Parcel Post Label cancelled by an East Hendred cds dated NO 14 13. 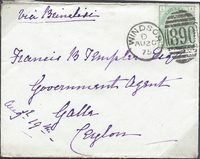 1918 Pangbourne (PAG) (under Reading) unstamped Parcel Post Label cancelled by a Pangbourne cds dated 30 Dec 18. 1917 SPEEN (SPQ) under Newbury, Parcel Post Label cancelled by Speen/Newbury cds dated 30 MY 17.